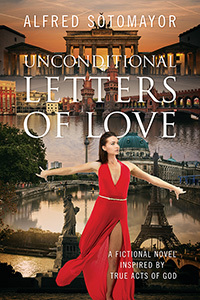 Alfred Sotomayor’s “Unconditional Letters of Love” is a fascinating journey through a unique love story that gives one man and one woman a chance at a spiritual connection ordained in Heaven and experienced on Earth. Leonard Bach has always been proud by his German heritage, and dreams of finding a Christian girl with German blood to be his soul mate. However, Leonard finds himself enthralled by a dancer…and he wants to write a book about her. Thus begins an odyssey of love letters unlike any ever written before, as Leonard follows his soul mate, Julianna, all over the world, guided by her angels, his angels, and mystical forces. Previous Previous post: Save Big Money With Free Shipping! Next Next post: July Brings Three Times as Many FREE Author Copies For Authors Self-Publishing With Outskirts Press!